Bristol Rovers came from behind to earn a fourth straight League Two away win with victory at Cambridge United. The hosts took the lead when Barry Corr nodded in his eighth goal of the season from Harrison Dunk's left-wing cross. Ellis Harrison tapped in an equaliser on the rebound after the break when Chris Dunn parried Matt Taylor's shot. The turnaround was completed late on as Taylor capitalised on a poor backpass from Greg Taylor to round the keeper and calmly move Rovers up to ninth. Match ends, Cambridge United 1, Bristol Rovers 2. Second Half ends, Cambridge United 1, Bristol Rovers 2. Attempt blocked. Jeff Hughes (Cambridge United) right footed shot from outside the box is blocked. Corner, Bristol Rovers. Conceded by Chris Dunn. Attempt saved. Matty Taylor (Bristol Rovers) right footed shot from the centre of the box is saved in the bottom right corner. Alie Sesay (Cambridge United) wins a free kick in the defensive half. Foul by Matty Taylor (Bristol Rovers). Corner, Cambridge United. Conceded by Mark McChrystal. Mickey Demetriou (Cambridge United) wins a free kick in the defensive half. Substitution, Cambridge United. Conor Newton replaces Ryan Donaldson. Goal! Cambridge United 1, Bristol Rovers 2. 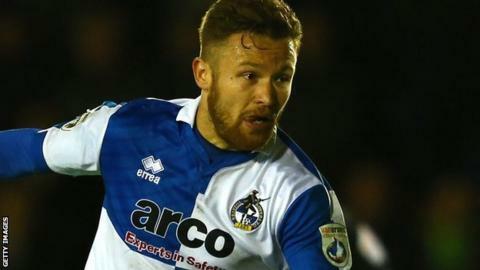 Matty Taylor (Bristol Rovers) left footed shot from the centre of the box to the centre of the goal. Attempt blocked. Rory Gaffney (Cambridge United) right footed shot from outside the box is blocked. Harrison Dunk (Cambridge United) wins a free kick in the defensive half. Corner, Bristol Rovers. Conceded by Mark Roberts. Substitution, Cambridge United. Rory Gaffney replaces Liam Hughes. Substitution, Cambridge United. Mickey Demetriou replaces Robbie Simpson. Goal! Cambridge United 1, Bristol Rovers 1. Ellis Harrison (Bristol Rovers) right footed shot from the centre of the box to the high centre of the goal. Attempt saved. Matty Taylor (Bristol Rovers) right footed shot from the left side of the box is saved in the centre of the goal. Ellis Harrison (Bristol Rovers) wins a free kick on the right wing. Attempt saved. Ellis Harrison (Bristol Rovers) right footed shot from outside the box is saved in the top centre of the goal. Lee Mansell (Bristol Rovers) wins a free kick in the defensive half. Attempt blocked. Ryan Donaldson (Cambridge United) right footed shot from outside the box is blocked. Corner, Bristol Rovers. Conceded by Luke Berry. Attempt blocked. Billy Bodin (Bristol Rovers) right footed shot from outside the box is blocked. Ellis Harrison (Bristol Rovers) wins a free kick in the attacking half. Foul by Mark Roberts (Cambridge United). Attempt saved. Jermaine Easter (Bristol Rovers) with an attempt from the centre of the box is saved in the centre of the goal.